This beef pie has a very British feel to it, despite its French origins. I was asked exactly what makes it French, and I must admit to struggling to find an answer. There’s some garlic in it, I suppose, and it has that general feel of traditional French cooking…simple, practical, thrifty and generous of flavour…but really, it could be British. The heart of the pie is brisket, a kilo, cut into roughly four centimetre chunks. The quality of the beef is important. Good brisket should have some fat to it, and will have been rolled and tightly tied. It might even have been matured for a bit longer than normal, too. Dust the chunks of beef with flour and fry them in a large frying pan with some olive oil, just so that they start to pick up a little colour around the edges. Do this in batches, don’t crowd the pan, etc, etc. Transfer the pieces to a large pan when they’re done, and then dust with a little extra flour and add two whole, peeled onions, a couple of peeled carrots, roughly chopped into two or three pieces and a pair of similarly chopped celery stalks. Add four sprigs of thyme, two bay leaves, a generous shake of white pepper and some salt. Pour enough hot beef stock over to cover and bring it all to a gentle simmer. You could make a beautiful, rich stock from roasted beef bones, a variety of root vegetables and a few litres of water. You could make stock in vast quantities and freeze it, which would be extremely admirable, but, really, an OXO cube or three will do the trick. This is the first time I’ve used OXO cubes for a while, and I discovered that they’re no longer actually cubes. Instead, they look more like an X, with a deep notch etched out of each side. This design oddity means that they’re easier to break apart, which is especially useful if you only need, say, a quarter of a cube. It’s a clever little trick, and it even managed to irritate arch-Tory Norman Tebbit, which is an unexpected bonus. Anyway, back to the pot. Let the beef simmer away for half an hour, skimming it when necessary. Fish the vegetables out at this point and set them aside…they should be tender. Continue to simmer the beef for at least another hour, maybe more, until the meat is just about ready to fall apart. As the beef cooks, boil six large potatoes in their skins until they’re cooked through but still fairly firm – about fifteen minutes. 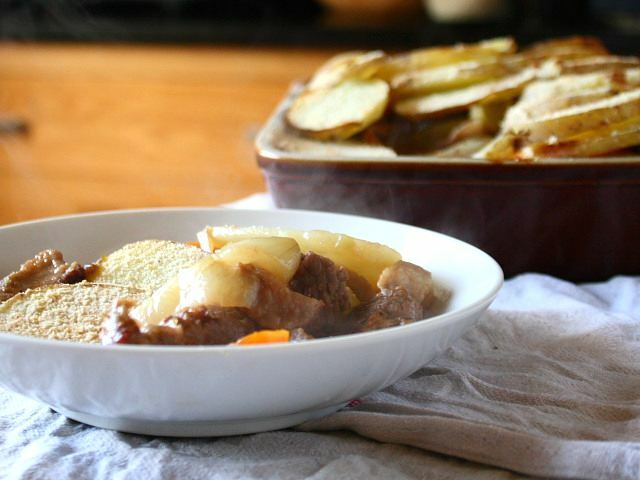 Remove the meat from the stock and break it up into smaller pieces with a fork, and slice the potatoes into thick disks. Place the meat into a large baking dish. Chop the cooked vegetables up into small pieces and add them to the meat, mixing well. Check the stock for seasoning. It should be slightly thickened and heady with beef flavour. Whisk in a knob of cold butter to give the sauce an extra shine, and then ladle it over the meat and vegetables. Arrange the sliced potatoes on top of the meat in overlapping layers, then sprinkle a large handful of breadcrumbs, a chopped garlic clove and some chopped Italian flat-leaved parsley over the top and bake in a 180c oven for half an hour. The potatoes will start to colour, the breadcrumbs will brown and the whole will become piping hot. Could be British, yeah. Reminds me of potato topped Lancashire hotpot. Love the stewed beef. This looks delicious and certainly has a British look and feel to it. I am sure there as an amount of culinary crossover during the Norman conquest. Did they take it with them? or leave it behind? My kind of meal! Thanks for sharing.